In her book, The Step Up Diet, Dr. Katalenas pens the nutritional advice she has successfully been giving her patients for years. As a pediatrician for over 25 years, Dr. Katalenas has seen firsthand the rise of obesity among her patients. To fight the epidemic, she created the Step Up model, an easy three-step plan to help transform the whole family’s eating habits. The goal of the Step Up model is to allow families to change their diet one meal at a time. In the book, Dr. Katalenas focuses on the principals of quality, quantity, and timing to help guide decisions on what to eat, how much to eat, and when to eat a meal. She has seen with her own patients, that if the entire family sticks to the plan by accomplishing one step at a time, a family will be on the path to a healthy eating routine in less that 8 week. Quality. Families should focus on the quality of the food they eat. By using more natural and less-processed food, they will begin to see a change in their lifestyle. Learn more about making quality food choices. Quantity. Quality is also being compromised by quantity – both the quantity of food and the quantity of food choices. Focus on portion control. Learn to use smaller plates and avoid going back for seconds. Learn more about choosing the right about of food to eat. Timing. Eat only 4 times a day every 3-4 hours. In addition to the detailed meal plans, she provides wholesome recipes that are inspired by her Spanish/Mediterranean background. Learn more about scheduling means and snacks. Dr. K is the owner of Pediatric Center of Round Rock, located in the Austin metro area. She is available for public speaking and interviews for TV, radio, and print publications. 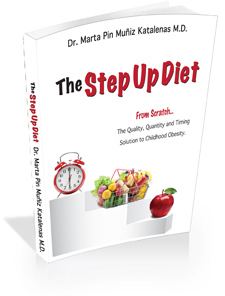 Visit Dr. K’s Amazon.com page to read reviews and learn more about The Step Up Diet.